The Perfect Pancake pan has two sides: The top is a flat griddle while the bottom has four recessed holders. Just heat up the pan and pour your pancake batter (or crack an egg) into each of the recessed holders. Close the pan while your pancakes or eggs cook. Flip the pan, cook a little while longer and then open the Perfect Pancake and slide your eggs or pancakes out onto a plate or platter. No need for a pancake turner! It really is that simple. And since this pan has a non-stick surface, you don’t need to use oils or butter when cooking which helps cut out some of the calories. Nonstick surface means that you never have to use extra butter or oil. No extra fat means no extra calories. Slide pancakes and eggs out without using a spatula or pancake turner. Pancakes look like they were made by a veteran short order cook and are of uniform thickness: No need to worry about uncooked batter in these cakes! 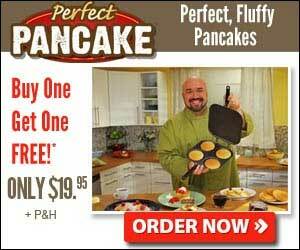 You can use the Perfect Pancake to make crepes and fruit pancakes too. Even works for cooking eggs.